A mining company in Middelburg, Mpumalanga, was developing a new head-office building and wanted a modern infrastructure that used IP systems wherever possible, including for security. To facilitate this, a new IP infrastructure was laid and the company required that its security installations were integrated on the IP network in order to save time, money and also to have a unique interface in terms of technical support. It also saw the need to implement systems that were modular and could be expanded if and when needed. Making use of a system integrator, Project Presentations, Came BPT’s IP360 was selected as the intercom for the new building. Riccardo Battaini, MD of Came BPT SA says the decision was finalised as soon as Project Presentations showed the management of the company what can be done using the IP360 intercom system. “Project Presentations themselves said the IP360 was very easy to install and to commission. They even went as far as saying they would define it as ‘plug and play’ easy”, says Battaini. To install the system to the client’s requirements, an IP entry panel and four Futura IP monitors were installed and connected to the IP network. The system’s flexibility allows it to open three different gates without having three different entry panels. To meet the needs of the client, the integrator had to ensure that not only was the IP video intercom installed on the network, but also various IP cameras and other access control systems – the tasks were all handled by Project Presentations. 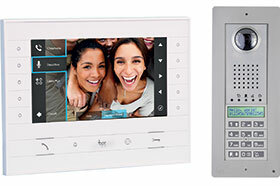 “Using Thangram IP entry panel they could use the keypad provided for intercom calls as an access control keypad as well,” notes Battaini. Through proper planning and the use of an experienced system integrator, the project was completed on time and without any problems.